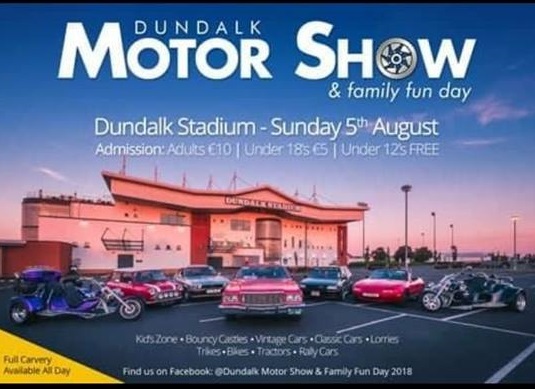 Dundalk Motor Show & Family Fun Day is being launched on Sunday the 5th of August 2018 at Dundalk Stadium. This is a motor show like no other as our show is open for everyone to display! Classic, Vintage, Modified etc. Cars, Trucks, Tractors, Bikes, Trikes etc. Standalone engine? Bring it along! The show is static. Venue is fully tarmac! Also for anyone with lowered vehicles there are no ramps! There is no cost to display your motors in our show! All we ask is that you email to confirm your attendence in order for us to designate sections for the different categories. There will also be trading stalls at the show. Here at Dundalk Motor Show we are all about family hense the reason we wanted to make our show a family fun day! There will be bouncy castles, facepainting along with a small selection of kids carnival rides!